The homes for sale this year are inherently more desirable. This is unlikely to be the case, as there hasn’t been a sea change in the Chandler real estate landscape in the last 10 months. There are fewer homes available for sale, so buyers move quickly when a new home hits the market. This is unlikely to be true as well, since we have seen nearby cities’ volumes either increasing or flat; I doubt Chandler’s volume has decreased against the other cities’ trends. There are more buyers than there were last year, so they need to act quickly in order to secure a contract. Ding Ding Ding! This is our most likely answer. Homes selling faster should also lead to lower inventory levels and higher prices (the old Supply and Demand rule from basic economics.) But this isn’t a chart about lower inventory or higher prices. The real question is: Where are all these buyers coming from? I don’t know that answer yet. If you do, I recommend heavy marketing in that area. Assuming the trend holds true, we should see homes sitting on the market a little longer as we head into the fall / holidays, before the market picks up steam again in the spring. 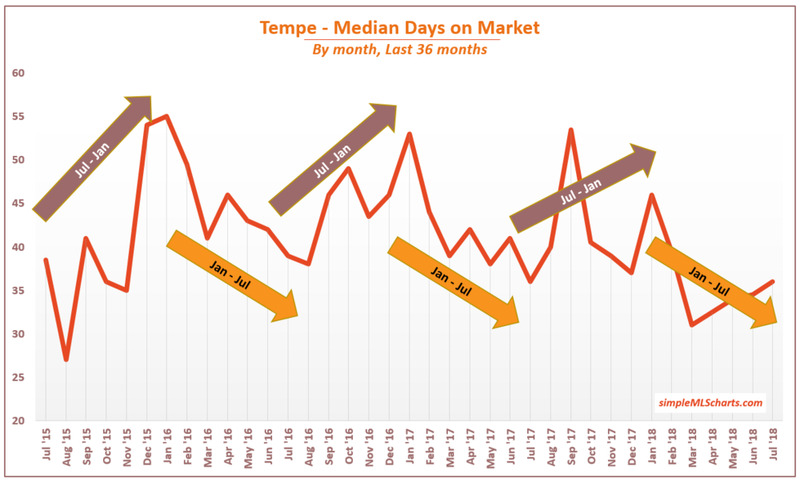 The Median number of Days on Market in Tempe over the last 3 years has fluctuated between 27 in Summer 2015 and 55 in Winter 2016, without much of a trend upwards or downwards. In other words, the market hasn't gotten much hotter or cooler over the last 3 years. However, the seasonality is very easy to see. The Tempe market heats up in the spring and summer months, with homes selling faster from January through July. Then, like clockwork, the market slows down again, with homes taking longer to sell from July through January.